From his teenage years, Alexandros Panagoulis was inspired by democratic values. He joined the youth organisation of the Center Union party (E.K. ), known as O.N.E.K., under the leadership of Georgios Papandreou. The organisation later became known as Hellenic Democratic Youth (E.DI.N.). After the fall of the Colonels’ regime and the restoration of parliamentary rule, Panagoulis became the Secretary-General of E.DI.N., on 3 September 1974. Alexandros Panagoulis participated actively in the fight against the Regime of the Colonels. He deserted from the Greek military because of his democratic convictions and founded the organization National Resistance. He went into self-exile in Cyprus in order to develop a plan of action. He returned to Greece where, with the help of his collaborators, he organized the 13 August 1968 assassination attempt against Papadopoulos, close to Varkiza. The attempt failed and Panagoulis was arrested. I didn’t want to kill a man. I’m not capable of killing a man. 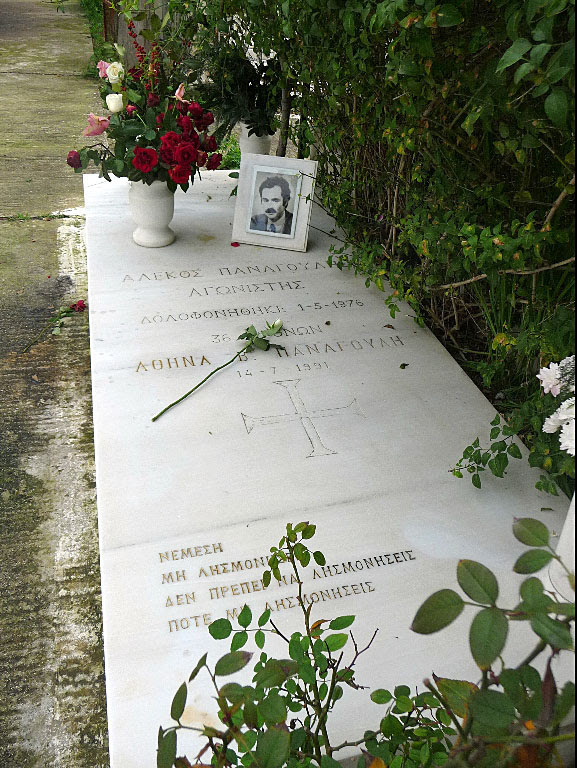 Panagoulis was put on trial by the Military Court on 3 November 1968, condemned to death with other members of National Resistance on 17 November 1968, and subsequently transported to the island of Aegina for the sentence to be carried out. As a result of political pressure from the international community, the junta refrained from executing him and instead incarcerated him at the Bogiati Military Prisons on 25 November 1968. Alexandros Panagoulis refused to cooperate with the junta, and was subjected to physical and psychological torture. He escaped from prison on 5 June 1969. He was soon re-arrested and sent temporarily to the camp of Goudi. He was eventually placed in solitary confinement at Bogiati, from which he unsuccessfully attempted to escape on several occasions. He reportedly refused amnesty offers from the junta. In August 1973, after four and a half years in jail, he benefited from a general amnesty that the military regime granted to all political prisoners during a failed attempt by Papadopoulos to liberalize his regime. Panagoulis went into self-exile in Florence, Italy, in order to continue the resistance. There he was hosted by Oriana Fallaci, his companion who was to become his biographer. After the restoration of democracy during the Metapolitefsi, Alexandros Panagoulis was elected as Member of Parliament for the Center Union – New Forces party in the November 1974 elections. He made also a series of allegations against mainstream politicians who he said had openly or secretly collaborated with the junta. He eventually resigned from his party, after disputes with the leadership, but remained in the parliament as an independent deputy. He stood by his allegations, which he made openly against the then Minister of National Defence, Evangelos Averoff, and others. He reportedly received political pressure and threats against his life in order to persuade him to tone down his allegations.